Have an international purchase order but not the capital to buy the goods necessary to fulfill it? With RMP Capital’s International Purchase Order Financing, we can advance the money needed so you can take on orders you weren’t previously able to. Through our sister company, RMP Trade Credit, Purchase Order Financing provides the necessary working capital for your business when you have sales orders but need the money to fulfill the transaction. We do this by funding your purchasing needs so you can complete your sale to your customer. 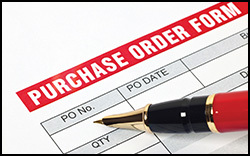 Purchase Order Financing is the perfect solution for short term funding requirements with your credit worthy customers. It can be used to finance the purchase or manufacture of specific goods that have already been sold. We enable this process by issuing letters of credit or providing funds that allow our clients to secure the inventory they need. Many types of businesses can take advantage of this financing but we find that the most common are: manufacturers, distributors, importers, and exporters. By utilizing RMP Trade Credit it can protect your reputation of being able to handle large business accounts and expand into global markets. Our international expertise will allow your company to handle imports and exports while transferring payment to foreign buyers. To receive a “White Paper”, a detailed document on how our purchase order financing works, fill out our form and we will send you a copy.